Since the whole is much much more important than the parts (Context is King™), it is important to have a cohesive and holistic Framework (meta-framework) for all the Frameworks used to aid Enterprise Transformation, to ensure that the emphasis is to use these different frameworks to optimise the whole of the Transformation domain rather than just the parts. To stop Enterprises optimising the parts at the expense of the whole, and to begin to allow Enterprises to optimise the whole at the possible expense of the parts. 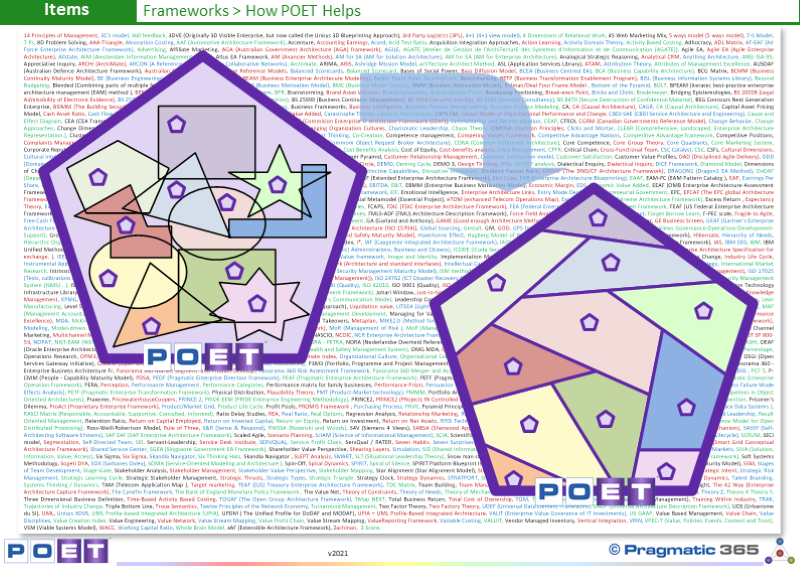 ¨ Firstly, and most importantly, POET provides this framework to Enterprises today - for Enterprises to be able to consider and optimise the whole of this strategically important Transformation domain. POET is the only framework in the world that does this. ¨ Secondly, it provides a framework to Framework Providers as a basis (a super-type if you will) to allow frameworks to begin to align themselves with this coherent and holistic environment. This will provide another benefit to Enterprises in the future because it will allow them to see much more clearly how these Frameworks relate and interface to each other in clear and straight forward ways which allow the holistic adoption of them to be much more straightforward. Of course this is likely to take a long time because framework providers tend to want to argue about their differences rather than agree on areas of similarity. Currently, to try to understand how all these different frameworks are related is almost impossible. For all the frameworks you want to use or do use, you need to map each framework to each other framework, to try to understand how they relate. But as framework providers begin to use POET as the context for their frameworks, and map their frameworks to POET, it will become much much easier for Enterprises and the people who are accountable for how Transformation is effected, to be able to understand how they all relate, enabling them to make more informed decisions about who needs to use what, where, why, how and when. What Transformational Frameworks do you use? What do you use to decide which Frameworks to use, where and how? What do you use to orchestrate the Frameworks you use into a holistic, coherent and cooperative whole?